Chappie Is Pretty Good. It’s Not District 9, But That’s Okay. If you’ve seen Neill Blomkamp‘s Elysium, you may have given up on him, despite the fact that that can be considered a bit of an overreaction, especially since his first movie, District 9, was pretty good. That being said, let’s not forget that his second movie wasn’t by any means terrible, though it wasn’t always terribly logical–why would a space station not have any means to defend itself, and have to rely on Earth-bound agents to launch missiles at approaching craft? Suppose that particular operative were sick? Or if they happened to be on the other side of the planet–the Earth rotates, which means that Elysium wouldn’t be seen from one part of the world for at least twenty-four hours. Anyway, Blomkamp is back with Chappie, and it’s pretty good (as in better than Elysium, though not in District 9’s ratified strata). 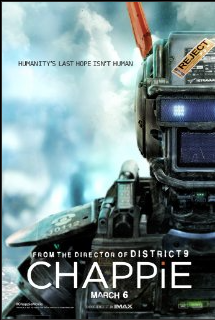 The movie revolves around a robot that comes to be known as Chappie (voiced by Neill Blomkamp regular Sharlto Copley), and explores what it means to be human. Blomkamp’s love of South Africa is in full effect–as I understand it, the South African government makes it very cost-efficient to film there, though I get the feeling that he loves the country and finds the stark contrasts between well-to-do and dirt poor fascinating–which is why it’s the go-to destination for all of his movies so far. Chappie is also looser than anything that Blomkamp has done so far, and while the cutesy robot stuff may go on a bit longer than necessary, it’s a minor point and doesn’t stop one from enjoying a pretty good movie. Posted in Columbia, Movies, review, Sony.Tagged District 9, Elysium, Neill Blomkamp, Sharlto Copley.